Gardeners often don't save their own seed because they are concerned that the plants might cross with other similar plants and produce seed that is not true to type. 1. What plant will actually cross with what? Botanical families can be broken up into genera (plural of genus) and genus broken up into species. The first part of the Latin name of a plant is its genus and the second part of the Latin name is the species. A River Red Gum is a Eucalyptus camaldulensis. The first part of its name is the genus (Eucalyptus), the second part the species name. As a general rule, plants will only cross within same species. Pumpkins and watermelons are both in the same family, (Cucurbitaceae) and you may quite like them both but would you want something with a blend of their flavour and characteristics? Nearly all the pumpkins we grow are three species of the genus Cucurbita. They are Cucurbita maxima, C. moschata and C. pepo. Two varieties of C. maxima (Eg Turks Turban and Triamble) grown nearby will readily cross, however neither should cross with a Butternut Pumpkin, because it's a C. moschata. Watermelons are in the genus Citrullus. They and jam melons are the only members of the species (vulgaris) normally grown, so watermelon varieties will only cross with other watermelon varieties and jam melons but won't cross with pumpkins because they are different genus and species. We advise gardeners to favour seed suppliers who provide details of Latin names in their catalogues but accept that there may be errors in the catalogues. Some of the garden vegies commonly grown are self-pollinating and don't readily cross with other plants. In some cases it may be that having come so far from their origins there are none of the natural pollinators adapted to pollinating them in our environment. Some self pollinators that can be grown with minimal chance of crossing include most tomatoes, lettuces, peas, annual bush and climbing beans. 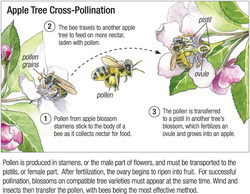 If they do cross, how is the pollen transferred? With some plants the pollen is transferred by insects - less often by birds or animals. Other plants rely on the wind to take pollen from one plant to another. With some, it can be both wind and insects. Honey bees are often the most common and most efficient pollinator and they can fly long distances from the hive. Flights of 2-3 km from the hive can be expected at times, however this is for nectar with a higher sugar content than I would expect with garden vegies other than sunflowers. The limited research that I have read is that honey bees tend to be species specific. This means that if a bee is working pumpkin flowers it would be more likely to fly 150m to another pumpkin flower rather than 1m to a borage flower. Different varieties in the same species of a group of plants that are bee pollinated should be separated by at least 500-800m if flowering at the same time with 1.6km generally recommended. Honey bee pollinated plants may include sunflowers, all the Cucurbitacae family (pumpkins, watermelons, rockmelons, cucumbers, gourds), onions, leeks, all the cabbage family, all the umbelliferae family (carrots, celery, dill, chervil, coriander, fennel, parsnip, parsley). Insect pollinated plants that seem to have some, but often only minimal crossing may include eggplants, broad beans and perennial runner beans. Wind pollinated plants include silverbeet, beetroot, spinach, orach, the amaraths, maize (corn), the different sorrels, rhubarb and sorgum. Varieties within species are best separated by distances of perhaps in excess of 1km or isolated by time. That means, planted at different times so that they don't flower together. So, what crosses with what? Appendix B from 'The Seed Savers Handbook' by Michel & Jude Fanton gives an excellent guide. See separate pages on this site for pumpkins, members of the cabbage family and members of the carrot family. Armenian Cucumber. Cucumis melo: Crosses with rockmelons, insect pollinated. Artichoke- Globe. Cynara scolymus: Only expected to cross with other globe artichokes. Asparagus. Asparagus officinalis: Will cross with other asparagus varieties and wild asparagus. Insect pollinated. Male and female flowers are borne on separate plants. Broad beans. Vicia faba. Small amount of insect pollination but largely self fertile. Will only cross with other broad bean varieties. Bush beans. Phaseolus nanus: Self fertile and shouldn't cross with other beans. Annual climbing beans. Phaseolus vulgaris: Self fertile and shouldn't cross with other beans. Beetroot Beta vulgaris: Wind pollinated and will readily cross with different varieties of beetroot, silver beet and sugar beet. Broccoli Brassica oleracea: Crosses with cabbages, cauliflowers, Brussels sprouts, some kales, kohl rabi and collards. Insect pollinated, separate from other B. oleraces by 1-1.6km See brassica file on this site. Brussels Sprouts Brassica oleracea: Crosses with cabbages, cauliflowers, broccoli, some kales, kohl rabi and collards. Insect pollinated, separate from other B. oleraces by 1-1.6km. See brassica file on this website. Cabbage Brassica oleracea: Crosses with Brussels sprouts, cauliflowers, broccoli, some kales, kohl rabi and collards. Insect pollinated, separate from other B. oleraces by 1-1.6km See brassica file on this website. Cape Gooseberry Physalis peruviana: Not expected to cross with anything else. Capsicums Capsicum annum: May cross with other capsicums and chillis excepting the perennial black seeded Capsicum pubescens. Can be insect pollinated. See CAPSICUM & EGGPLANT file on this site. Carrot Daucas carota: Crosses with other carrots and the flower Queen Ann’s Lace. Insect pollinated. See Umbelliferae file on this website. Cauliflower Brassica oleracea: Crosses with Brussels sprouts, cabbages, broccoli, some kales, kohl rabi and collards. Insect pollinated, separate from other B. oleraces by 1-1.6km See brasica file on this site. Celeriac Apium graveolens: A celery like plant that forms a good flavoured bulb. Crosses with celery. Insect pollinated. See Umbelliferae file on this site. Celery Apium graveolens: Crosses with celery. See umbelif file on this site. Chervil Anthriscus cerefolium: Unlikely to cross with anything else. See Umbelliferae file on this site. Chillis: There is some confusion regarding their species and it is unclear which will cross with what, expect all but C. pubescens to potentially cross with one another and capsicums. See Capsicum & Eggplant file on this site. Chinese cabbage. Brassica rapa: Crosses with turnips (not Swede turnips), mizuna, tatsoi. See brassica file on this site. Chives Allium schoenoprasum: Not expected to cross with any other members of the family. Collards. Brassica oleracea: Crosses with Brussels sprouts, cabbages, broccoli, some kales, kohl rabi and cauliflower. Insect pollinated, separate from other B. oleraces by 1-1.6km. See brasica file on this site. Coriander. Coriandrum sativum: Unlikely to cross with anything else. See umbelif file on this site. Corn. Zea maize: Crosses with sweet corn, popcorn and maize. Wind pollinated, separate from other corn varieties by at least 1.5km. Cucumber. Cucumis sativus: Will readily cross with other cucumber varieties but not expected to cross with anything else. Insect pollinated. Dill Anethum graveolens: Unlikely to cross with anything else. See umbelif file on this site. Each species is expected to only cross with their own species and cross pollination between different varieties is minimal. Flowers are not attractive to bees so 20 m may be sufficient isolation. See CAPSICUM & EGGPLANT file on this site. Fennel Foeniculum vulgare: Expected to only cross with other fennel varieties and possibly wild aniseed. See umbelif file on this site. Garlic chives Allium tuberosum: Shouldn't cross with any others in the family. Most Kales are B. oleracea and will cross with Brussels sprouts, cabbages, broccoli, collards kohl rabi and cauliflower. Insect pollinated, separate from other B. oleraces by 1-1.6km See brassica file on this site. Russian Red Kale is B. napus and will cross with swede turnips and canola. Insect pollinated and should be isolated from other B. napus by 1-1.6km See brassica file on this site. Kohl Rabi Brassica oleracea: Will cross with Brussels sprouts, cabbages, broccoli, collards some kales and cauliflower. Insect pollinated, separate from other B. oleraces by 1-1.6km See brassica file on this site. Lettuce Lactuca sativa: Self fertile and not subject to crossing, grow a number of different varieties side by side and save the seed. Mizuna Brassica rapa: Crosses with Chinese cabbage, turnips, pak choi, wong bok, tatsoi. Insect pollinated, separate from other B. rapa by 1-1.6km. See brasica file on this site. Onion Allium crepa: Will cross with other onion varieties, possibly shallots and occasional crossing with spring or welsh onions. Insect pollinated and recommended separation from 1-1.6km from other onion varieties. Pak Choy- See Chinese cabbage. Parsnip Pastinaca sativa: Only expect4ed to cross with other parsnip varieties, insect pollinated with a recommended isolation from other parsnip varieties of from 1-1.6km. See umbelif file on this site. Parsley Petroselinum crispum: Only expected to cross with other parsley varieties and Hamburg parsley. Insect pollinated with 1-1.6km isolation recommended. See umbeliferae file on this site. Pea Pisum sativum: All garden peas are believed to be self fertile and shouldn't cross with other pea varieties. Radish Raphanus sativus: Only expected to cross with other radish's but not the weed wild radish. Allow 1-1.6km isolation from other radish varieties. Radish seed remains viable for some years so only allow one variety to go to seed at any time. See brassica file on this site. Rhubarb Rheum rhubarbarum: Unlikely to cross with any other garden vegies. May be self infertile so at least two genetically different plants may be needed to get viable seed. Rocket Eruca sativa: Not expected to cross with any other garden vegies. See brassica file on this site. Rockmelon Cucumis melo: Will cross with other rockmelon varieties and Armenian cucumbers. Insect pollinated and 1-1.6 km separation of different varieties recommended. See melons file on this site. Shallot Two references, either Allium crepa or A. fistulosum so may cross with either spring onions or bulb forming onions. Spinach Spinacis oleracea: Will cross with other spinach varieties, male and female flowers on separate plants. Spring onion Allium fistulosum: May cross with shallots and possible crossing with bulb forming onions but not common. If growing different varieties then allow one variety to flower and remove flower heads from others before they flower until enough seed has formed on first variety. Then remove all remaining flower heads from first variety and when all flower heads remaining have finished allow a second variety to flower. Squash Cucurbita pepo: Will cross with zucchinis, other squash varieties and some pumpkin varieties. See pumpkins file on this site. Swede turnip Brassica napus: Will cross with canola and Russian Red kale. Insect pollinated, separate from other B. napus by 1-1.6 km. See brassica file on this site. Tomato - Predominately Lycopersicon lycopersicon: Some of the smaller current tomatoes are L. pimpinellifolium. Most tomatoes are self fertile and don't readily cross, potato leafed varieties an exception and these will receive pollen from other tomatoes. See tomatoes file on this site. Turnip Brassica rapa: Crosses with Chinese cabbage, mizuna, pak choi, wong bok, tatsoi. Insect pollinated, separate from other B. rapa by 1-1.6km. See brassica file on this site. Watermelon Citrullus vulgarus: Will cross with other water melon varieties and jam melons. Insect pollinated with 1-1.6 km separation recommended. See melons file on this site. Wong Bok Brassica rapa: Crosses with Chinese cabbage, mizuna, pak choi, turnips, tatsoi. Insect pollinated, separate from other B. rapa by 1-1.6km. See brassica file on this site. Zucchini Cucurbita pepo: Will cross with other zucchini varieties, squash and some pumpkins, insect pollinated and 1-1.6km separation recommended. See PUMPKINS file on this site. References used- Seed to Seed by Suzanne Ashworth, The Seed Savers Handbook by Michel and Jude Fanton. Eden seed catalogue. Non-profit groups such as garden groups, organic groups, permaculture groups or similar are encouraged to distribute this material by computer printouts or photo-stating. Groups are encouraged to make their own pamphlets to photocopy and sell for profits for their group.